South Boston Speedway rejoined the NASCAR Busch Series Grand National Division schedule in 1994 after undergoing a massive expansion program. Formerly a .357-mile track, the speedway was enlarged to .400-mile prior to the start of the 1994 season. The track was a charter member of the NASCAR Busch Series Grand National Division in 1982, and, with the exception of 1992 and '93, has played host at least one race every year since. 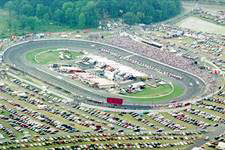 In 1998, the track debuted a new racing surface. The speedway offers fans action from the NASCAR Winston Racing Series on a weekly basis as well as events from the NASCAR Busch Series and NASCAR Slim Jim All Pro Series. Location: From Highway 58 West take 360 East (toward Richmond). Track is two miles to the right. From 501 North to 58 East take Hwy 360 East. Track is two miles on right.